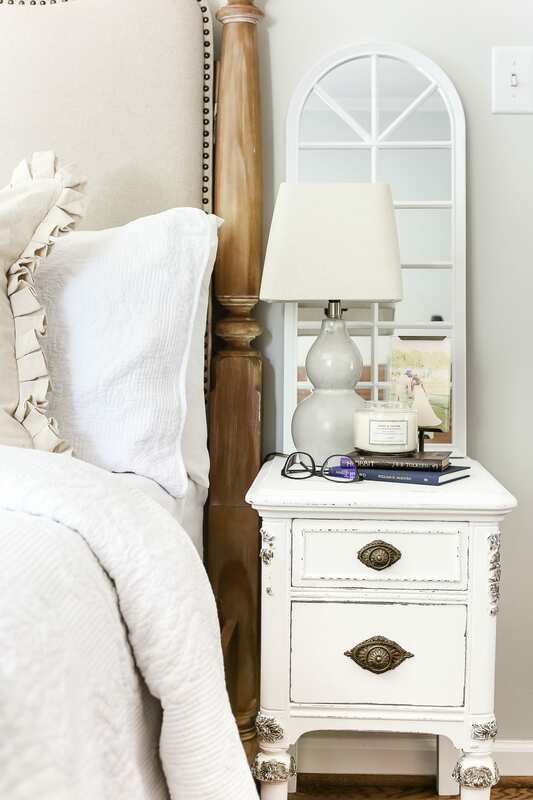 A pair of old, broken wooden nightstands gets a bright white, French-inspired facelift with a faux gilded bronze finish. Sometimes I think furniture can teach us a big lesson about people if we really listen. Like a wobbly table that just needs someone to believe in it. 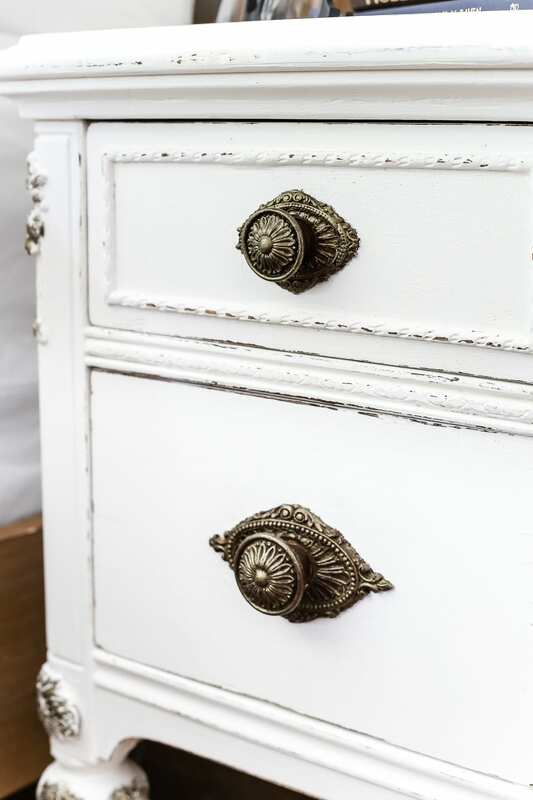 Or a dresser that shows its age in its bang ups and broken knobs, like stretch marks and gray hairs, but is still breathtakingly beautiful. 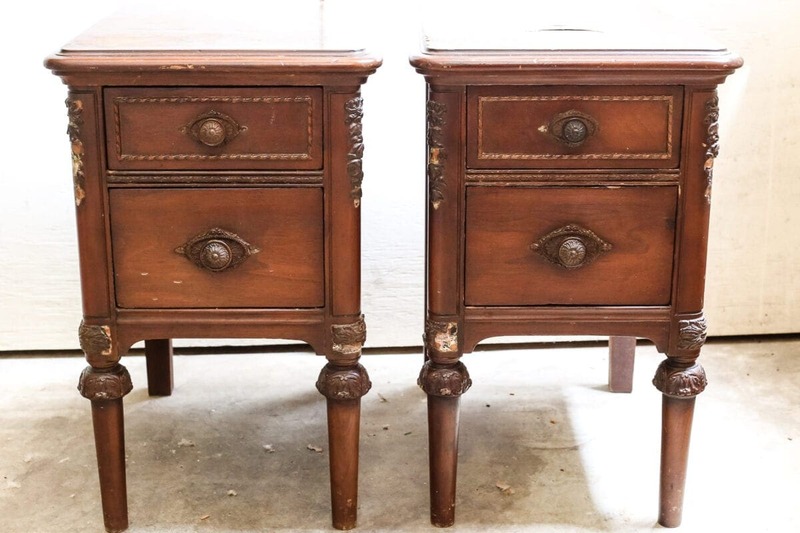 Or a couple of nightstands that have so much life left to live, if someone would just give them the chance. I really do wonder what stories furniture could tell sometimes. I’d been searching high and low for a pair of nightstands to use alongside our new bed in our master bedroom, but since we’ve been so limited on space, our choices have been slim. Reeeaaaally slim. Here’s what I used to spiff ’em up. 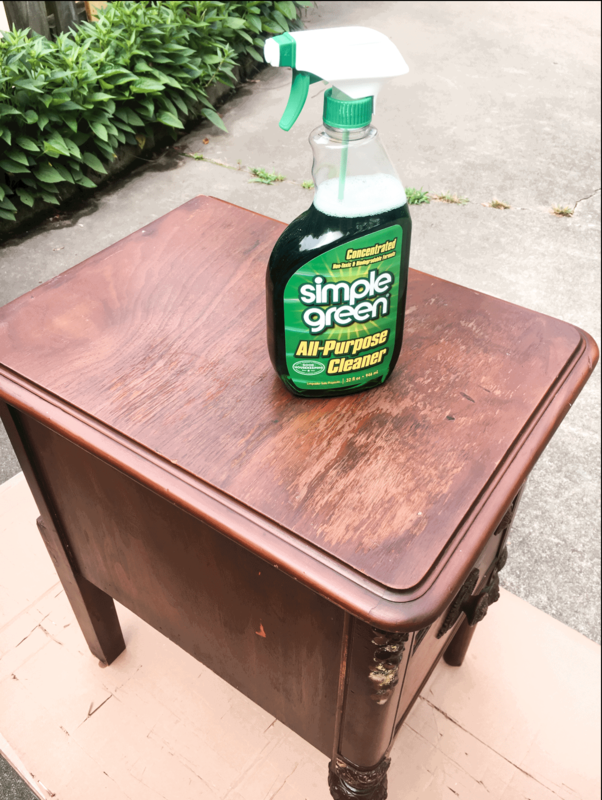 Simple Green has become my new favorite for cleaning up any grime on furniture. 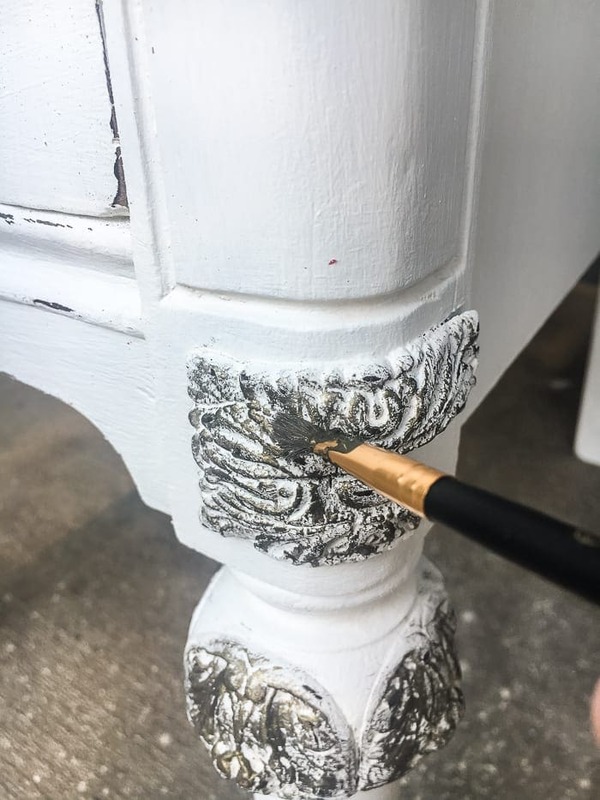 I use Fusion Mineral Paint a whooole lot, but even though it’s technically “no prep”, I still like to give the really icky pieces a good wipe down. 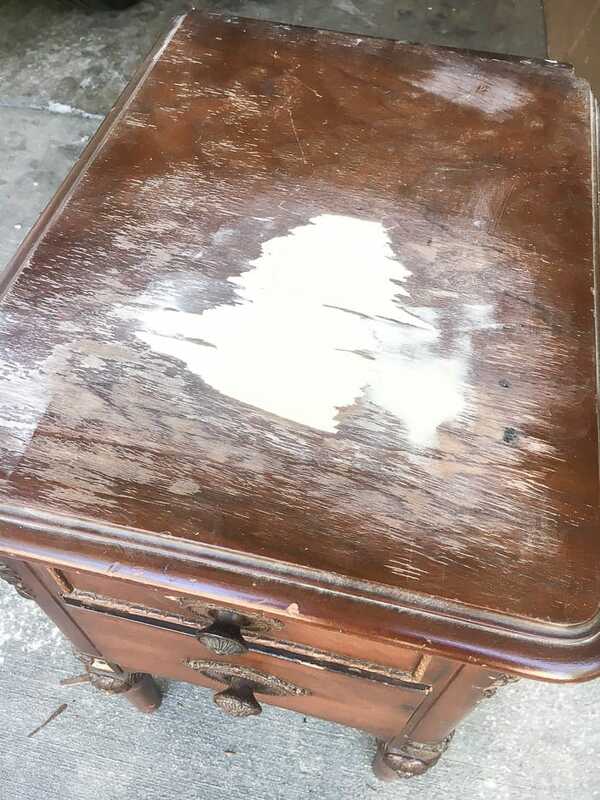 The insides of the drawers were musty smelling too, so I filled the insides of them with charcoal briquettes, baking soda, and dryers sheets and let them air out for 48 hours. I’m telling ya. ICKY! But that trio of stink busting did the trick. The top of one of the nightstands was in really bad shape to the point of having a gaping hole in the veneer. 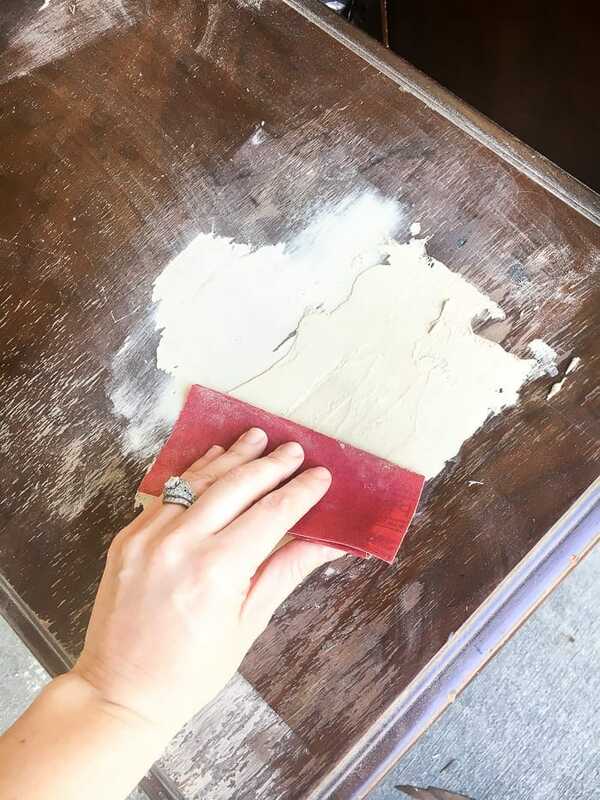 So I scraped away all of the loose veneer with a putty knife and pressed wood filler into the hole, then let dry for 24 hours. I gave the dried wood filler a good sand down the next day with the medium grit to patch it, then ta da! Smooth as buttah! Well, okay, it still didn’t look pretty, but we were going places. 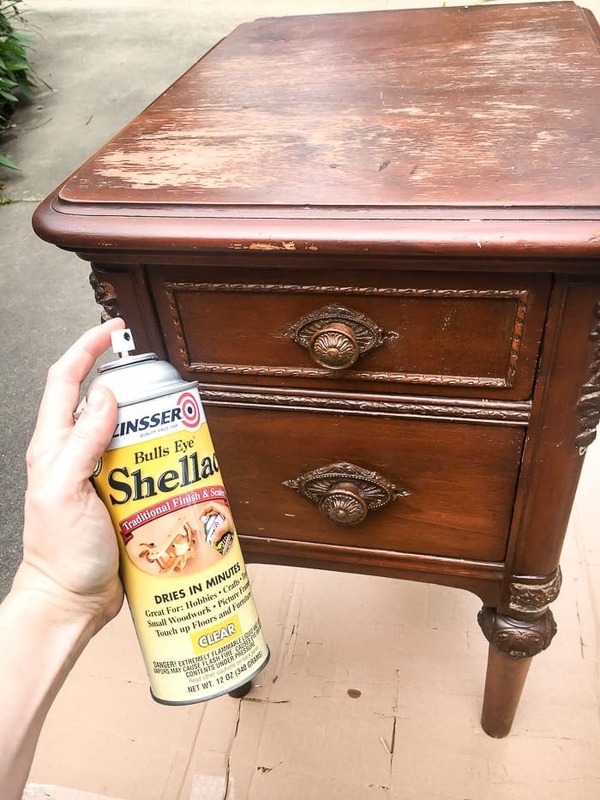 A lot of times, before I paint dark stained wood furniture, I like to give it a quick coat of spray shellac to prevent any bleed-through, especially when I plan to use white paint. Otherwise, your white paint might turn a lovely shade of pink. I ended up having to use 3 coats of the Fusion Picket Fence paint since the stain was so dark. 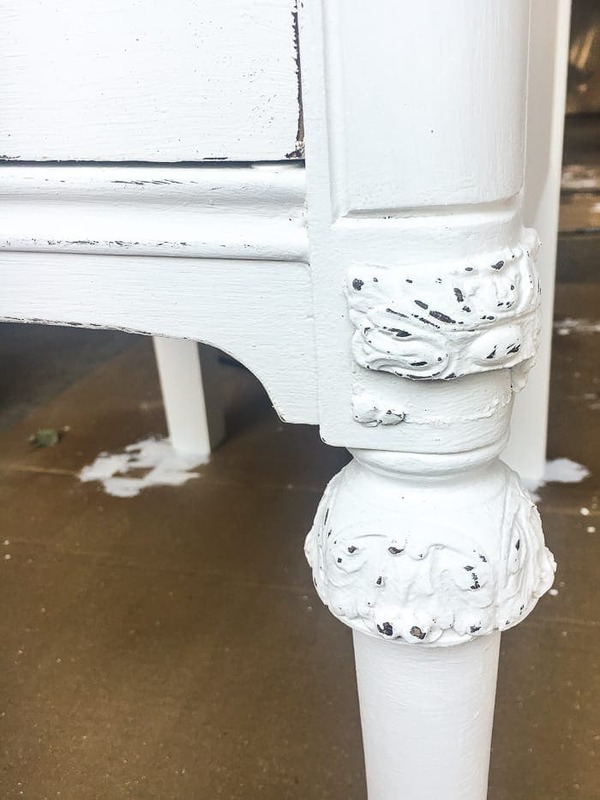 I get a lot of questions about this paint because I’ve used it on pretty much every piece of furniture in the past year. 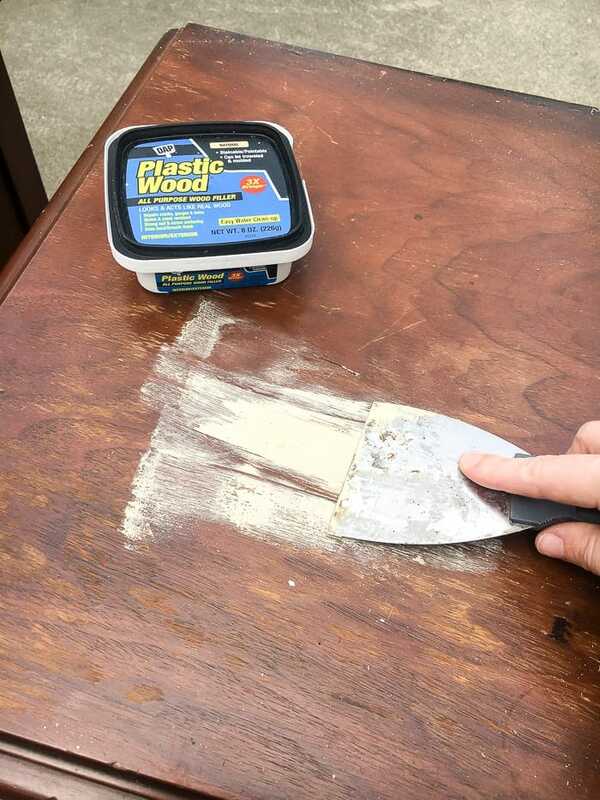 There are virtually no brush marks, and it requires no sealer, so it’s the perfect paint for furniture painting beginners, to me. I prefer it now over chalk paint. My new favorite brush is this natural bristle one because I can more easily paint any intricate details with it, and I don’t have to reload my brush as often. 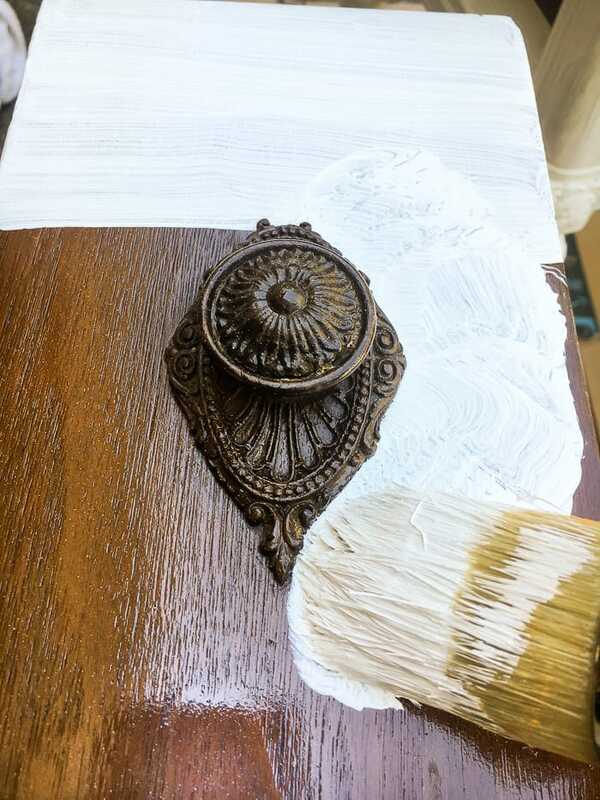 These nightstands had carved wood knobs that were majorly glued down to the drawer fronts, so I just painted around them. Then, I gave some of the little details a sanding to add some depth. A lot of the applique pieces on the sides of the nightstands had been broken, but I still love them. I almost left them alone at this point, but I was itching to show off some of the details a little more. So bronze paint to the rescue! I didn’t use much, just a mostly dry brush with the smallest amount of bronze paint dabbed into the little carvings to show them off. And I brushed some bronze on the raised part of the knobs to give them some depth. It’s like a pageant team went all Gracie Lou Freebush on these beauties. They turned out so very French and feminine and chic beside our bed. It’s funny to me that this bedroom is shaping up to be much softer, curvier, and more romantic than our master bedroom in our last house, which was all masculine and angular. The neutralness of it all is calming, but part of me is still craving some color, so we’ll see where that goes. 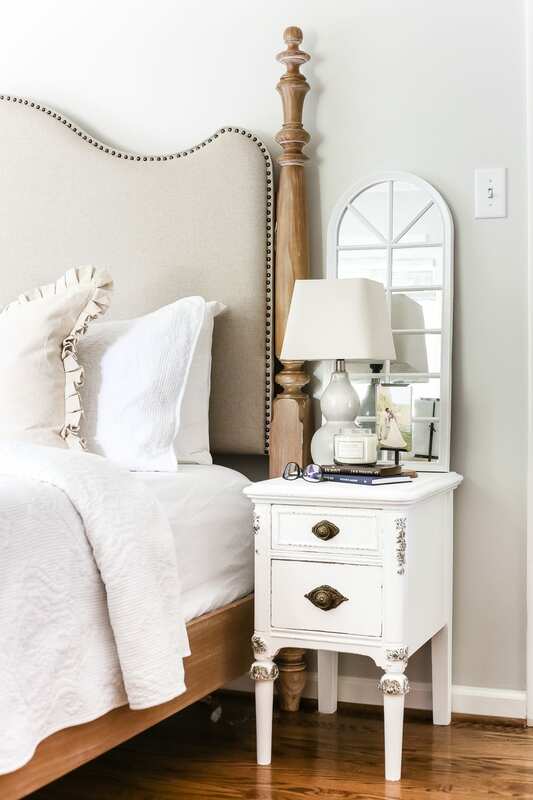 Color or not, these little nightstands seem to fit right in. I’m still thinking I need a rug to break up all of the wood in this room between the furniture and the floor at some point, but I haven’t had much time to wrap my brain around that yet. Got any suggestions? I’m all ears over here. P.S. Do you like our choice of reading? Harry Potter and The Hobbit. We nerd so hard. We still have a lot of other areas downstairs to conquer before we can really focus on this bedroom, but it’s nice that I don’t have to fumble around for my glasses on the floor in the dark anymore, so there’s that small victory. 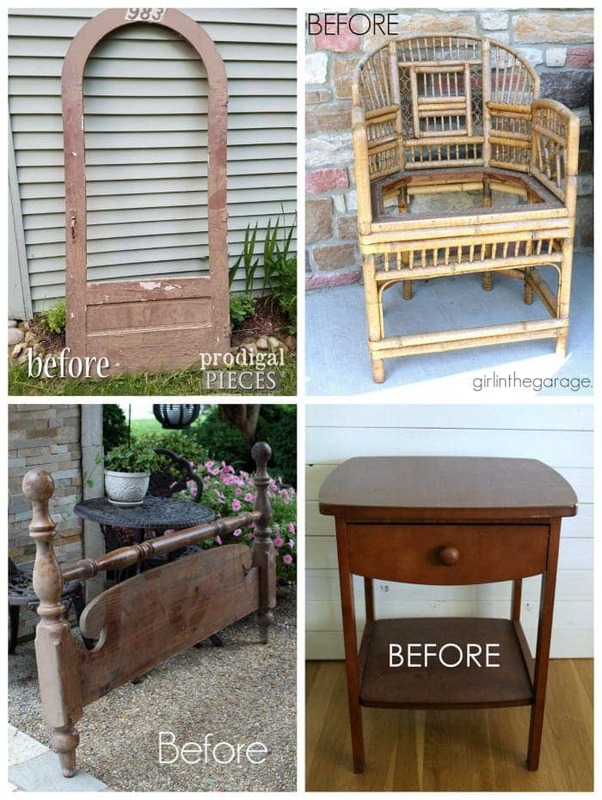 If you want more thrifty ideas, you can check out all of the past Trash to Treasure Tuesdays here. What a gorgeous save, Lauren! They look perfect in your bedroom. Bravo!! 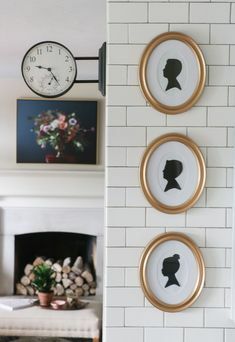 I love the french theme you have going on throughout the house! I read Chelsea’s ebook last winter and decided that I wanted to mix my French love with an Industrial flair for my hubby. It’s a goal for this year in choosing our decor. So I’m saving these ideas– PS. What colors are you thinking of adding? I did a soft, but deep green and it’s super lovely. I love those tables. They are so beautiful. They were lucky to find you!!!! Beautiful! Love the ‘Ms. Congeniality’ reference…spot on! Beautiful job, Lauren. It’s hard to believe the knobs are wood, they really look like metal now! Petite tables, with the bonus of having drawers – that’s a great score. LOVELY!!!! 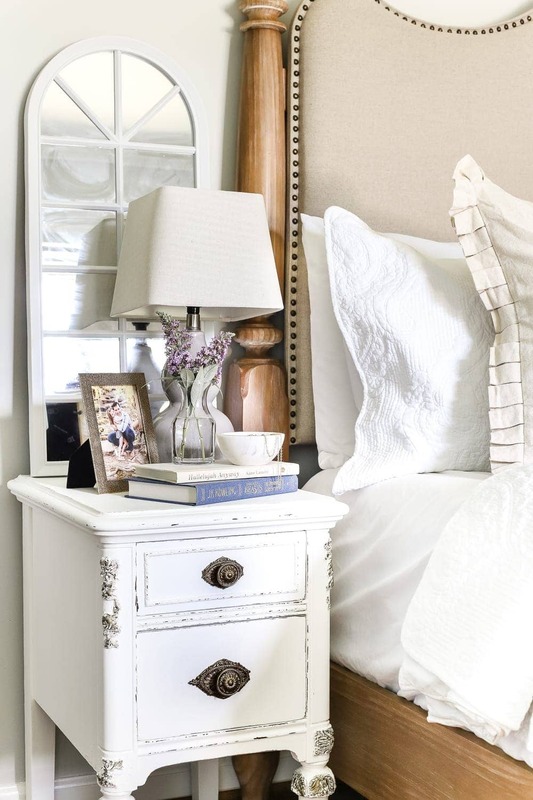 I love breathing new life into old furniture…and those nightstands are GORGEOUS now!!! 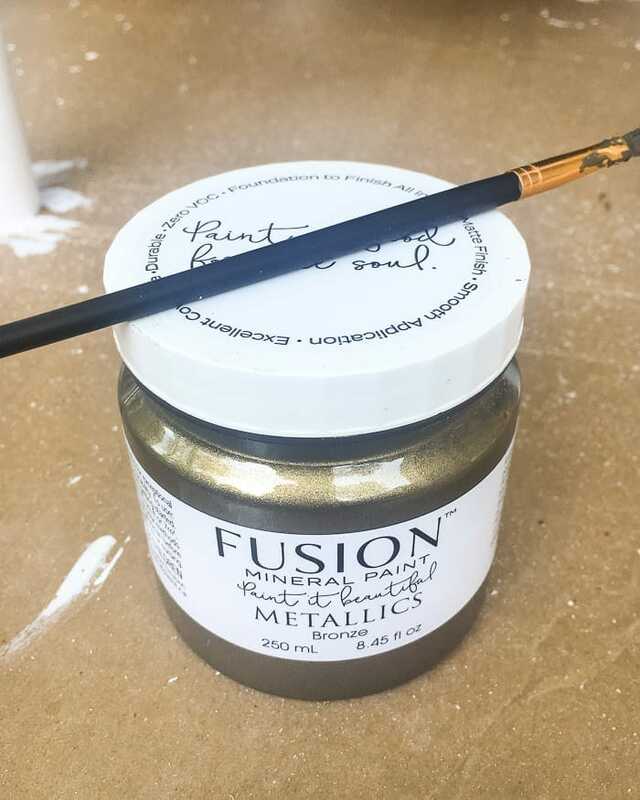 I’ve always been a GF milk or chalk paint girl, but I’m excited to try the fusion paint now!! Thank you for sharing!! That bed is gorgeous. Where did you find it? Love the nightstands painted!! Very nice detail, thank you Lauren! This makes me look at furniture differently, so pretty and useful! Breath taking. Every detail you chose was perfect! the plant on the nightstand makes me think that a faded/antiqued sage Persian-esk rug would look great. Beautiful! I love the touch of metallic. I looked high and low for a reasonably-priced rug for my living room and found http://esalerugs.com/rugs . They are low-pile synthetic, but the colors are really nice, and come in all kinds of great patterns. I chose a Arts and Crafts style rug for my living room (our house is a bungalow) and a pretty blue almost overdyed looking one for the office, and got some runners too. I have been very happy with them (and a 10 x14 cost less than $500 on sale), and I like that they show all kinds of angles of the rug and that the screen colors seem to be quite accurate. The rugs are imported from Turkey, which has wonderful machine made as well as handwoven textiles. they were well packed and shipped quickly, and I reused the tarp they were rolled in too. Do unpack large rugs quickly because they might be folded. Otherwise, RugsUSA, One Kings Lane, Overstock and Pottery Barn on sale are pretty reasonable too. Just gorgeous! They look like a perfect fit. 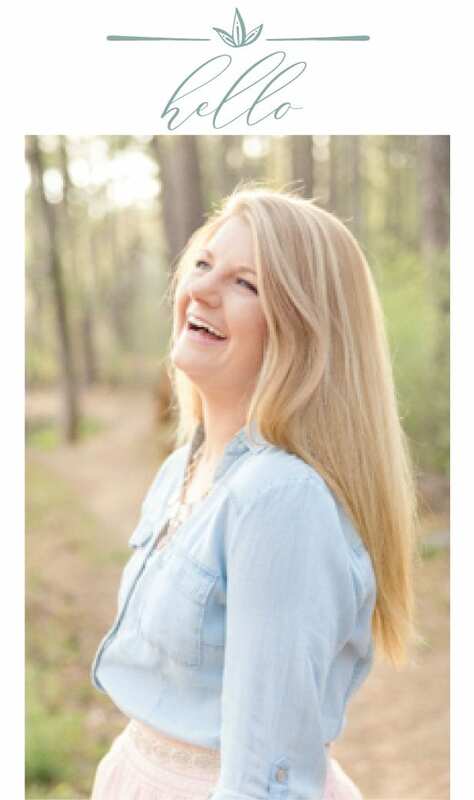 So beautiful, Lauren! 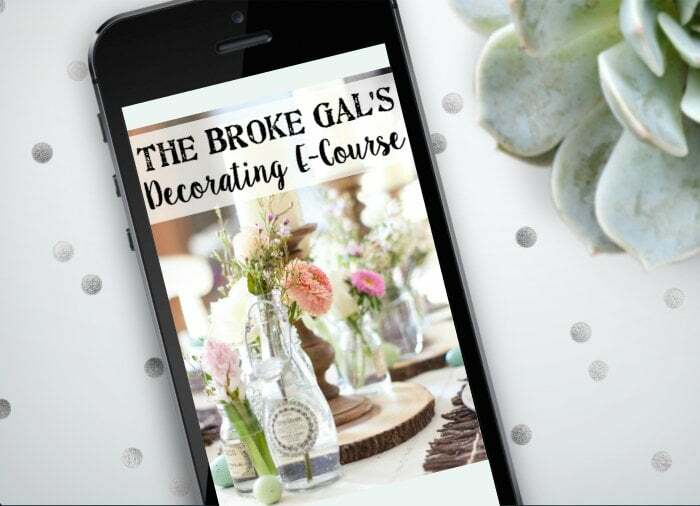 You gave them the right amount of TLC and Picket Fence was the perfect color choice. I love the metallic accents too. Your home is coming together beautifully. Lauren, these look soooo great! 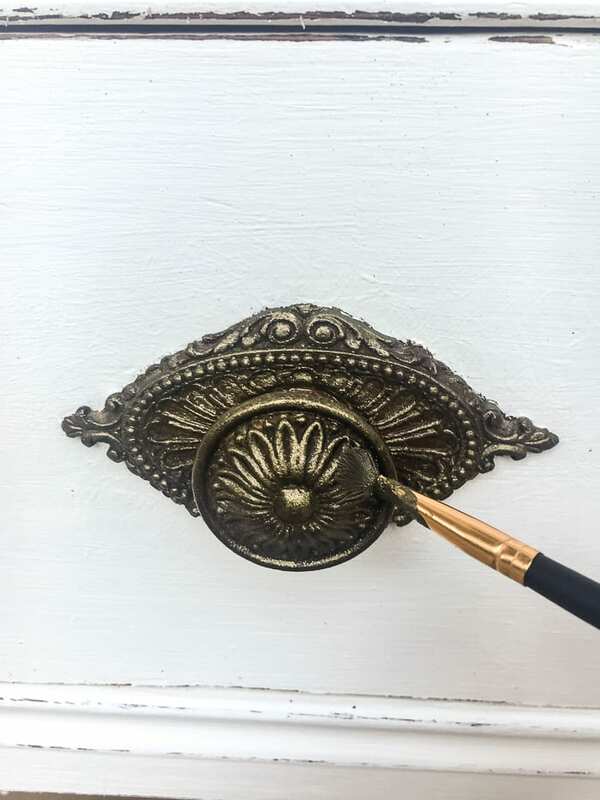 I love your use of bronze paint on the knobs. I can’t wait for our master bedroom to look as relaxing and inviting as yours does. I look forward to your posts each week! Love the make over on the night stands. For our new home master, I found a couple of lovely soft Aubusson runners on Overstock. They are just the right amount of color. 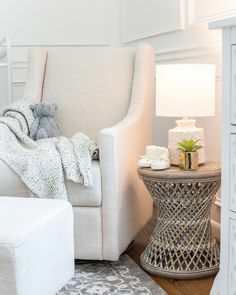 I am also loving the faded “Persian” rugs that are so popular right now! You are going in a different direction. It will be fun to follow along and see where it takes you. These really are treasures because they didn’t look like much before! Those are beauties now Lauren!! Ok, you had me at gilded nightstands, but then you accessorized them with the two best fantasy book series in the known universe! I think you are my soul mate. Rock on! OMG girl, you are good. Everything you touches turns into a gem. How creative/talent you are. Excellent designers. I love everything about the beauty you brought into these tables. Haha! 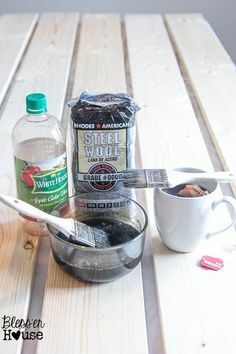 I just put about 5 charcoal briquettes, sprinkled baking soda, and put about 5 dryer sheets in each of the drawers and let it sit for 24 hours in our garage. 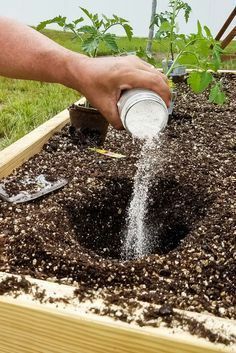 I vacuumed out the baking soda after and tossed the charcoal and dryer sheets. It helped soooo much. These are absolutely breathtaking! 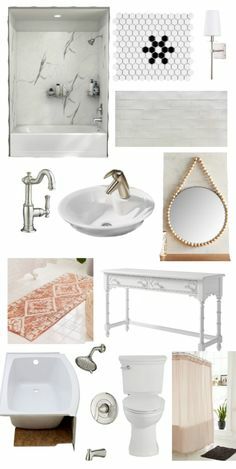 The more white I see being used on different projects the better I’m loving white! Well done!